Even when you want to get away from it all, there may be times when you still want it all close by, just in case. The Grand Hyatt Kauai Resort and Spa is an ideal option to create your personalized retreat, based on what you’re willing to leave behind and what you require for a Hawaiian vacation. This luxury resort is set among lush tropical gardens right on the water’s edge in Poipu, Kauai. Thanks to the large property, even if the Grand Hyatt’s 602 rooms are full, the grounds don’t feel crowded. You can wander through the gardens, lounge by a handful of swimming pools or lagoons, hit the beach, play golf or tennis, sample a variety of menus at on-site restaurants, learn a little about Hawaiian culture, or simply sit back and take it all in. Rooms have mountain, ocean or garden views, and have either one king or two queen beds. The spacious rooms include an iHome stereo with iPod dock, extra-large marble bathrooms, coffeemaker (with Hawaiian coffee), a comfortable work area, air conditioning, refrigerator for your favorite refreshments and Wi-Fi access. Rates start at $330 per night and vary, depending on time or year and type of room. A resort fee of $25 per room, per night are added to the room rate. The resort fee includes fitness center access for two, Internet access, self parking, two bottles waters per day, in-room coffee and tea, 10 percent discount at select property boutiques, one hour tennis court time per day, local phone calls and local newspaper. The Grand Hyatt is also an ideal hotel for families. It counts among the favorite places of my niece and nephew—who talk nonstop about the water slides, plenty of pool space and friendly birds that make their vacations here memorable. Not looking to stay with family? That’s fine, too. One of the pools is “adults only,” to keep a chill vibe. There’s also plenty of space for romance, whether it involves a candlelit dinner at Tidepools on stilts above the water or couples’ spa treatments in your private garden hale at Anara Spa. Wandering around the hotel property, I became lost on occasion, realizing that I’d taken the wrong route to my destination of the moment. But each time, I happened upon a gorgeous view, a small private spot, or a new feature I hadn’t seen before. It made me instantly forget I had an agenda, and allowed me to relax and enjoy. 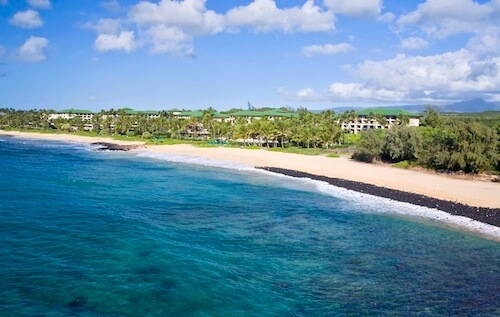 See more at the official website for Grand Hyatt Kauai Resort and Spa. Check prices online for the Grand Hyatt Kauai Resort & Spa at Hotels.com and Expedia or book a package with extras at Luxury Link.